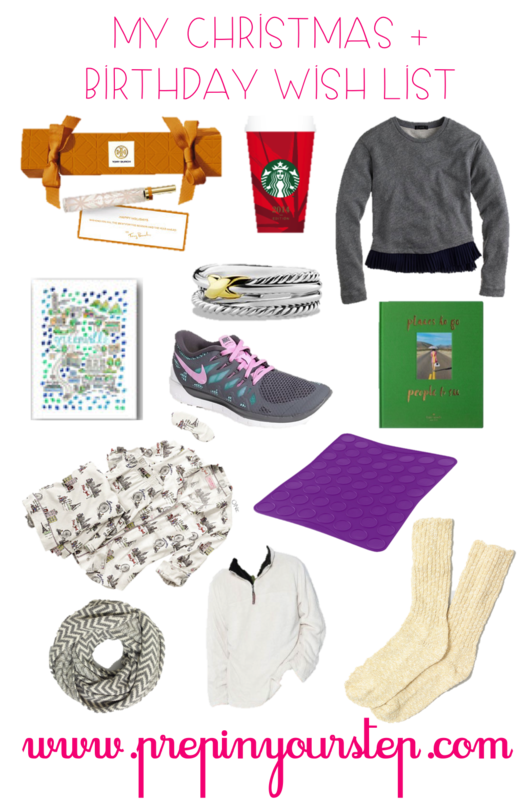 I know, I know it isn't even Thanksgiving yet (almost but not quite) and I am posting my holiday wish list. Forgive me for the eager posting of it however, my family always asks so I thought that y'all may be intrigued as well! I want to make it very clear that this is a wish list. I in no way expect to necessarily get anything from my list. These are just items I have had my eyes on and love which will hopefully give my family some ideas of products I would enjoy receiving this holiday season. Whenever I make my Christmas list I always feel a bit like a brat. As you get older the items you love and wish for tend to get more expensive making your list look more and more greedy. It is especially hard for me because I not only have Christmas but I also have my Birthday the day after so it's a double whammy. If I see anything throughout the year that I adore but wouldn't buy for myself it all gets stuck on this list. The past few Christmas' and Birthdays I have been spoiled so I am not really expecting this year to be a blowout since the last couple of years my family has been so gracious. Just keep these thoughts in mind as you are looking at this post and let me know if we have any overlap on our wish lists! Tory Burch Rollerball Perfume: I have a tiny sample of this perfume and adore the scent. Now that the sample is used up I would love to have a rollerball version. I don't wear perfume frequently enough to truly justify purchasing a full bottle and the rollerball aspect makes bringing it with me when I travel so easy! Starbucks Gift Cards: This is super self explanatory but I would love gift cards from friends and family who don't quite know what to get me! Starbucks, Barnes and Noble (we have a Starbucks inside of ours at school, and Panera would all be greatly appreciated). Ruffle Sweatshirt: J.Crew always amazes. I saw this sweatshirt and thought it would be such a fun winter wear. Super comfy with a touch of flare would make those mornings when you don't feel like getting dressed a breeze! David Yurman Ring: Ok so a girl can dream! I have two David Yurman bracelets that I wear every single day, I feel naked if I don't have them on! I don't really have a ring that I wear on an everyday basis and I have been lusting over this one for a while (I just love the stacked look of it). This is definitely something I hope to own at some point! Kate Spade Places to Go and People to See Book: Call me a child but books with pretty pictures can entertain me for hours. I was so excited when I heard that Kate Spade was coming out with another coffee table book (I have the first one and adore it) and just knew I needed to add it to my wish list. Nike Frees: I have owned a pair of Nike Frees since my sophomore year of high school and needless to say they are getting a bit worn down (read: I can see my sock). I love throwing them on instead of my running shoes (don't want to wear down the soles) when bopping around and I can't help but love all of the fun color combinations. This is definitely one of my more practical gifts! Scarf: The pattern of this scarf initially drew my attention and I can't get over how warm it looks. I prefer thick and cozy infinity scarves like this one in the winter and would love to have this to wear around. The grey allows it to be pretty neutral while the stripes add a bit of fun! Camp Socks: By the looks of my list y'all probably think I live in Anartica. What can I say, in the winter I just long to be warm. I have a pair of grey camp socks and they are the perfect things to keep my feet warm inside my bean boots and I would love to add a white or cream pair to my collection! PS FAM I made sure to get this up before all of the sales this weekend so shop wisely! I love the ruffled sweatshirt- it would look darling on you!